Opera Now – Artist of the month April 2017. Conductor Nicholas Chalmers is widely recognised as having established some of the most exciting and highly successful artistic projects in the UK in recent years. Nicholas is the artistic director of the award winning Nevill Holt Opera (Best Festival 2016), conductor with Northern Ireland Opera and a founding artistic director of Second Movement. With his long term collaborator, the director Oliver Mears, he has created over 20 productions and has been at the forefront of promoting young singers and contemporary music; the Rough for Opera series (produced by Second Movement) at the Cockpit Theatre, has commissioned and showcased over 40 young composers and librettists over the last 5 years. With Nevill Holt Opera, Nicholas has conducted; THE MAGIC FLUTE, LA BOHEME and THE TURN OF THE SCREW, CARMEN, RIGOLETTO and THE ELIXIR OF LOVE. Nevill Holt Opera will open a new opera house in 2018 designed by Witherford Watson Mann. This exciting project will provide a new artistic hub for the performing arts in the East Midlands. For Second Movement he has conducted MOZART AND SALIERI, TROUBLE IN TAHITI, THE MEDIUM and THE IMPRESARIO, LES DEUX AVEUGLES, ROTHSCHILD’S VIOLIN and THE KNIFE’S TEARS. Conducting engagements with Northern Ireland Opera include THE MEDIUM, TOSCA (Best Opera – Irish Times Theatre Awards) THE TURN OF THE SCREW, NOYE’S FLUDDE (Belfast Zoo, Beijing and Shanghai), THE FLYING DUTCHAMN, THE BEAR, MACBETH, THE MAGIC FLUTE, SALOME, DON GIOVANNI and POWDER HER FACE and COSI FAN TUTTE. 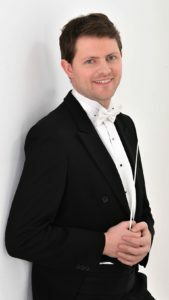 Nicholas studied music at Oxford University, conducting at the Piacenza and Milan Conservatoires and was on the music staff at English National Opera from 2008 to 2011. In 2012, Nicholas was the first person to conduct a Benjamin Britten opera in China with NOYE’S FLUDDE in Beijing. Recent engagements include; Messiah Opera National de Lyon, THE TURN OF THE SCREW Zurich Opera and NOYE’S FLUDDE China Philharmonic.